Melwa Group, a diversified business corporate in steel related industry, ventured into the healthcare sector, investing Rs. 1.4 billion to set up a pharmaceutical manufacturing facility in Ja Ela. The project would create 300 employment opportunities. This pharmaceutical manufacturing facility is a joint venture with the State Pharmaceutical Manufacturing Corporation(SPMC), and technical know-how from Nova Pharmaceuticals. “Through this new venture, Melwa Pharma expects to produce various pharmaceutical products to the local market and two year export to the region and African countries under Phase 1,” said Director Melwa, Muruganathan Pillai. 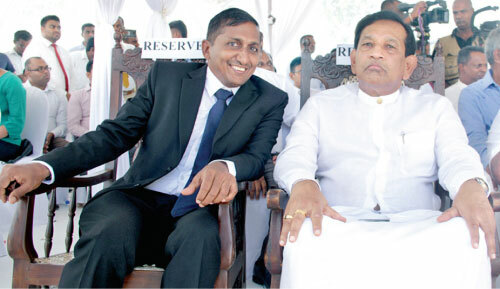 Minister Dr. Rajitha Senaratne, with Melwa, Chairman Anandaraja Pillai at the ground breaking ceremony for the Melwa Pharma plant. He said that one of the major factors that led to them to invest in Pharma was the 15 year buy back guarantee that was offered by the SPMC.Melwa has also signed up with Kelun Life Sciences Ltd., to manufacture IV fluids for local and export markets. The plant would be situated in the Kandy Industrial Park. Apart from the steel manufacturing and pharmaceutical industries, MELWA has also entered into the hospitality industry, setting up a portfolio of six branded five star hotels for the Hilton across the country with the collaboration of Hilton Worldwide. The investment is over US$ 100 million. Health Minister Dr. Rajitha Senaratne, who was the Chief Guest for the ground breaking, said that since 2016, 38 companies have already signed up to set up factories. Melwa is the fourth Sri Lanka Pharmaceutical Manufacturing plant. Dr. Senaratne said that due to free health care, the pharmaceutical market is one of the largest in the world, while there is also a huge mafia connection.Dr. Senaratne said that they had also introduced price controls to 73 drugs, which would be extended to 100 soon. He said that a foreign company that sold a cancer injection for Rs. 285,000, is now selling the same product for 185, 000 after the SPMC got involved in direct imports. This particular company has also opened a sales office in Sri Lanka only to sell this injection. ← Cutting off the nose to spite the face!